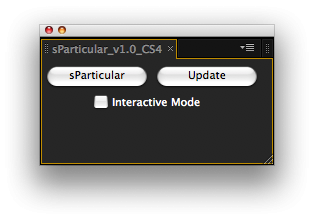 sParticular is a script for After Effects that helps you with 3D integration when using Trapcode Particular. If you apply particular on a layer, you will see that the particles are 3D aware if you have a camera. But if you have layers in your 3D space, the particles won't intersect with them. Particles are always "in front of" the 3D layers that are below the particules layer in the layer stack. Particular has a visibility option, where you can set a range where your particules are visible or not, let's say from 0px to 200px in Z space from the camera. What the script does is sort your layers in your comp so that the 3D layers stack on the composition regarding to their Z position, and then duplicates your particle layer between every 3D layers. All thoses instances have their visibility option expressioned to fill the Z range between the front and behind 3D object. Like that your particles are intersecting properly with your layers. It's not a true intersection, it rather an automation of a workaround, but it works great. Plus there are some options if you want to update your particle layer so that every instance get updated too. Supports Particular from v1.5 and above (including Particular 64bit update for CS5), and works fine with multiple Particular effects on the same layer.